12 July 2018: A multi-million pound regeneration project in Southampton took one step closer to completion this week as the penultimate phase of the development was officially completed. National Regional Property Group has been working on the £60m transformation of the city’s former fruit and vegetable market. The scheme, earmarked by Southampton City Council as one of its ‘VIP projects’, has seen the once run-down area of the city transformed into a sleek residential development called Bow Square. 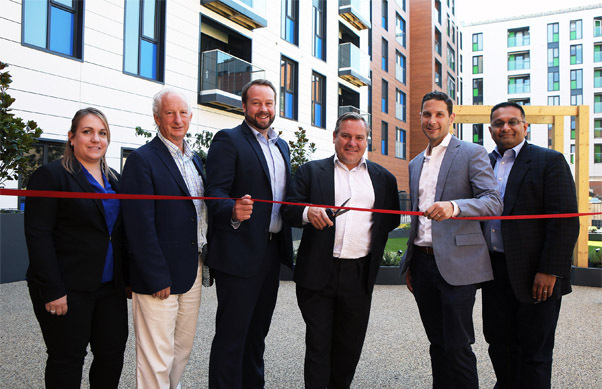 The first phase of 109 apartments was completed in October and this week National Regional handed over the second phase to owner Rockspring Investment Managers and its operating partner, Atlas Residential. The latest part of the development features 102 modern apartments as well as a gym, yoga suite, residents’ lounge and kitchen and a communal garden. The third and final phase, containing 68 homes, will be handed over later this year. National Regional Property Group’s chief executive, Shaun Adams, said: “We’ve been absolutely thrilled with the progress of Bow Square. Despite some very testing conditions with the Beast from the East earlier this year, construction has run on – if not ahead of – schedule for the entire project. Leader of Southampton City Council, Councillor Christopher Hammond said: “Working with developers such as National Regional Property Group is key to driving the city’s most important schemes forward. Bow Square is one of the seven Very Important Projects (VIPs) coming to fruition as part of our city centre Master Plan, securing £3bn of investment in to Southampton. Bow Square is Southampton’s first Build to Rent development, meaning the apartments are built with residents in mind and are only available to rent – they are all managed by one company, making it a far more welcoming atmosphere and enables the onsite teams to get things done quickly. The first phase of the development has reached 100 per cent occupancy and the new apartments in phase two are available to rent immediately.